Unless you're living under a rock without internet, TV or radio access (how are you reading this then ;-)) you'll know today is a big day in the United States. One of the world's biggest economies will finish spending vast amounts of money buying persuading voters to vote for one of two men to lead their country for the next four years. From Zapiro's own site: "National polls in the US show the U.S. Presidential Election to be a virtual tie, leading many pundits and analysts to brand the result "too close to call." 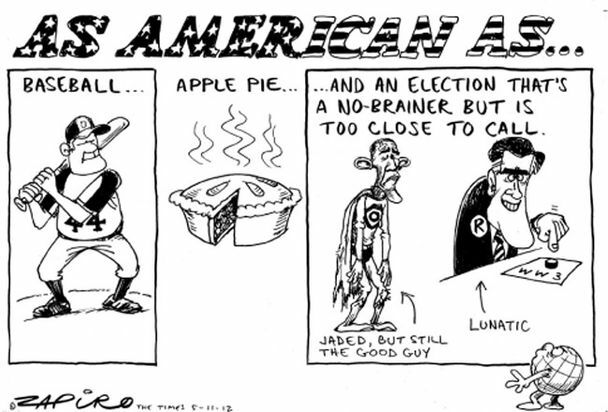 While Barack Obama has been a disappointment to many who expected him to make a real change, Zapiro's cartoon feels that the other guy Mitt Romney could be a danger to world peace." I hope, for the benefit of all Americans and the rest of the world, that Barack Obama gets a second term. I'm not convinced by Mr Moneybags Mitt Romney one iota.